Any tool that can be used to tighten a nut or bolt to a specific torque is known as a torque wrench. These tools are essentially socket wrenches, but with additional parts that allow for the measurement of torque. Put simply, torque is the amount of rotational force that causes rotation. It is typically measured in foot-pound increments. Torque wrenches are most frequently used to tighten the bolts on car wheels, but have many additional purposes. There are nine different types of torque wrench, and each have their own advantages and disadvantages. This is the most common type of torque wrench and are widely available almost everywhere. A click torque wrench uses a clutch mechanism that is calibrated to measure foot-pound increments accurately. The most common form of clutch used in a click wrench uses a spring and a ball detent. When the spring detects that the requisite amount of force has been used, is is able to release itself and force the ball detent out of its place, causing a clicking noise. This type of torque wrench has greater precision than many of the other torque wrenches available. It also has the advantage of providing and auditory clue, as opposed to a visual one which may be missed by the mechanic. A beam torque wrench is the most basic form of the tool. It uses two beams to calculate and indicate the amount of torque that has been applied. One of the beams is able to move freely at one end, which allows it to indicate, on a printed scale attached to the wrench, the amount of torque that has been applied. In a slipper torque wrench, a ball and a cam do all of the measuring. The roller exerts force on the cam and locks it in place when adequate force has been applied. If the operator attempts to add more force, the cam slips, therefore not applying any further torque. The deflecting beam torque wrench uses a deflecting beam instead of a spring to detect torque. This results in a tool that does not need to be calibrated as often. It also generally has greater durabilty than other types of torque wrenches. Its general operation is the same as a typical beam torque wrench; the only difference between the two is the way that the deflecting beam wrench reacts to relative displacement. Hubless torque wrenches are not used on cars, hence the name. They are used by plumbers to tighten pipe couplings. They generally look like a T-handle wrench, and use a clutch and ratchet. You cannot adjust the torque on hubless torque wrenches, they are preset so that they can tighten couplings without damaging them. Electronic torque wrenches allow you to view an accurate representation of torque on a digital screen. They use a strain gauge, which is attached to the torsion rod. They are able to store any measurements made in an internal memory device which can be printed or viewed on a computer. These are typically used by auto body shops to for in-processing, or in automobile factories for quality assurance. 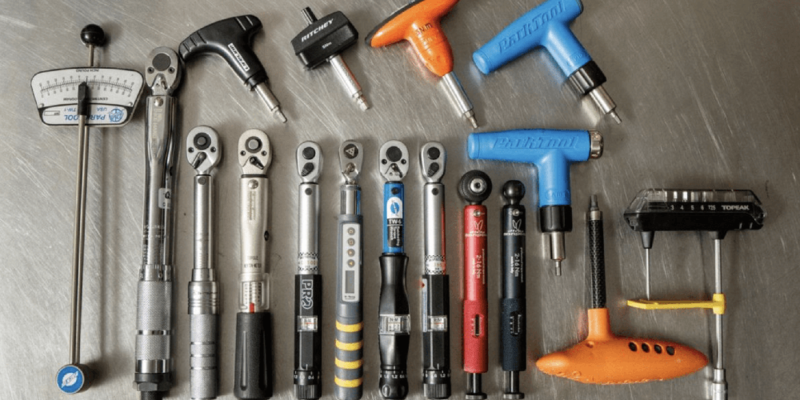 If you understood the mechanisms behind click torque wrenches, you will be able to grasp the idea of mechatronic torque wrenches very quickly. They use the same physics to determine torque, but instead of just offering a click for feedback, they are able to store the information electronically. Used for large torques that require extreme accuracy, hydraulic torque wrenches used the properties of water displacement and movement to measure torque. These are most frequently used in avionics and heavy machinery. These tools operate the same as electronic torque wrenches, but are also able to measure the angle that was used to tighten the fastener. They use a gyroscope to accomplish this task. The allows previously adjusted fasteners to be recognised and accounted for. They are also able to display the yield point of fasteners. Manufacturers love to use these tools to document the process of tightening torque under angle control. This is due to the fact that, in these applications, the angle of application works hand in hand with the amount of torque to make the machinery work properly.